First thing in the morning when we turned up at the Greensward at Frinton it was overcast but there was a NE onshore wind which initially was a little gusty and lumpy. However by lunch time the wind had steadied to a lovely 12mph wind and the sun came out! It was so lovely to sit there with the lifters nailed to the sky. We had ‘Larry’ the Lobster up with two Sea Horses lifted by Norman Cottrell’s beautiful handmade Sutton Flowform. Colin’s sled lifter stayed in the sky all day with his colourful banners and his newly acquired ‘Lulu’ penguin kite. 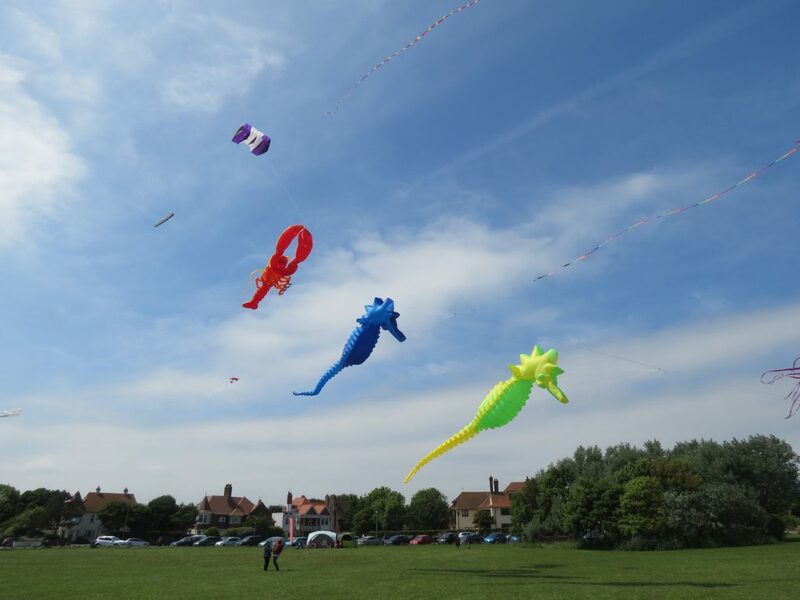 With the purple Octopus, Skeleton, Spirit of air’s, Bumblebees and various other kites the whole thing looked lovely in the afternoon sun. Everyone said that it was probably one of the best club flying days that we have had. Many thanks to Lyn for keeping us in teas and coffees all day.